Objectives: The aim of this study is to evaluate the efficacy and tolerability of Sudarshan Kriya Yoga (SKY) course in generalized anxiety disorder (GAD) outpatients, who after eight weeks of an appropriate dose of traditional therapy had not yet achieved remission. Subjects: The adult participants (18-65 years) were outpatients with a primary diagnosis of GAD with or without comorbidities on the Mini-International Neuropsychiatric Interview (MINI). Participants had a minimum of eight weeks standard treatment with an appropriate dose of a standard prescription anxiolytic, a clinician global impression-severity (CGI-S) score of 5-7, a Hamilton anxiety scale (HAM-A) total score ≥20 including a score of >2 on the anxious mood and tension items. Materials and Methods: Forty-one patients were enrolled in an open-label trial of the SKY course as an adjunct to standard treatment of GAD at the START Clinic for Mood and Anxiety Disorders, a tertiary care mood and anxiety disorder clinic in Toronto. The SKY course was administered over five days (22 h total). Subjects were encouraged to practice the yoga breathing techniques at home for 20 min per day after the course and were offered group practice sessions for 2 h once a week led by certified yoga instructors. The primary outcome measure was the mean change from pre-treatment on the HAM-A scale. Psychological measures were obtained at baseline and four weeks after completing the intervention. Results:Thirty-one patients completed the program (mean age 42.6 ± 13.3 years). Among completers, significant reductions occurred in the pre- and post-intervention mean HAM-A total score (t=4.59; P<0.01) and psychic subscale (t=5.00; P≤0.01). The response rate was 73% and the remission rate 41% as measured on the HAM-A. Conclusion: The results of this small pilot trial suggest that the SKY course represents a potentially valuable adjunct to standard pharmacotherapy in patients with GAD or treatment-resistant GAD, and warrants further investigation. In particular, changes in worry and body symptoms showed significant improvements that may further our understanding of the mechanism of change in the tolerance of anxiety and worry. Hatha yoga (in the US commonly called "yoga") as it originated in ancient India, consists of a system of spiritual, moral and physical practices. Two central and common aspects of yoga practice today are physical postures (asanas) and breathing exercises (pranayamas). These breathing exercises aim to focus the mind, facilitate relaxation and enhance wellness. Evidence suggests that these practices result in physiological effects such as increased parasympathetic drive, calming of stress response systems, neuroendocrine release of hormones, and modulation of thalamic generators. A review of the literature evaluating the different forms of yoga suggests potential beneficial effects on individuals with depressive disorders  as well as on anxiety, stress reduction and general well-being. ,,,,, However, the results need to be interpreted cautiously, since the sample sizes of many of these published studies are relatively small and many are not rigorous, controlled trials. Victory Breath (Ujjayi, Ocean Breath) uses a sound like one hears inside a seashell throughout inhalation and exhalation while breathing through the nose. The sound is created by a slight contraction of the laryngeal muscles and partial closure of the glottis. This creates airway resistance and enables control of the rate of air flow such that the breath cycle can be prolonged. Ujjayi is a slow, deep breathing technique at 4 to 6 breaths per minute. Three-Stage Pranayama with Ujjayi employs arm postures, a specific ratio for the duration of inhalation and exhalation phases, and breath-holds. During SKY, this is practiced for approximately 8 min. Ujjayi tends to be calming and to produce a sense of well-being. Bellows breath (Bhastrika) involves forceful rapid deep breathing through the nose at a rate of 20 to 30 breaths per minute. Each set of 20 breaths is called a "Round." Bhastrika is done in a seated position with the eyes and mouth closed. Three 1-min rounds of Bhastrika are each followed by 30 seconds of normal breathing. Arm movements are used to increase the force and depth of respiration. This breathing exercise lasts for approximately 5 min. The effects include increased ventilation, circulation, and alertness. Rhythmic breath technique (Sudarshan Kriya or SK): The translation of Sudarshan Kriya from Sanskrit is 'right vision through purifying action.' SK involves rhythmic, cyclical forms of breathing in which there are no pauses between inhalation and exhalation. During the Art of Living Course, a tape recording of Sri Sri Ravi Shankar's voice is used during SK to time the breaths using the sound so-hum ('so' for inhale and 'hum' for exhale). This Long Kriya involves multiple rounds of slow (8-14 respiratory cycles per minute), medium (40-50 respiratory cycles per minute), and fast (60-100 cycles per minute) cycles with varying rhythms and intensities. The Long Kriya lasts about 30 min. The daily home practice is a Short Kriya with simpler patterns and takes approximately 10 min. The purpose of this study is to investigate the SKY course as an adjunctive treatment for patients suffering from unremitted GAD, who were on medications and who had previously received a variety of treatments including CBT and mindfulness-based therapies (MBT). This study evaluated the addition of the SKY course to the standard treatments being given to patients suffering from GAD despite having received previous courses of standard treatments, including pharmacotherapy, CBT, MBT, and psychotherapy. Subjects were enrolled in the study after being referred from practitioners at the START Clinic for Mood and Anxiety Disorders, a tertiary care clinic in Toronto. Subjects with a primary diagnosis of GAD (with or without comorbidities) as assessed using the mini-international neuropsychiatric interview (MINI) were eligible for enrollment in the study. Patients were eligible for inclusion in the study if they were outpatients (aged 18-65 years) who provided informed consent, with a primary diagnosis of GAD according to the Diagnostic and Statistical Manual Fourth Edition Text Revision (DSM-IV-TR),  a minimum of eight weeks history of standard treatment with an appropriate dose of a traditional prescription anxiolytic, a clinical global impression-severity of illness (CGI-S) score of 5-7, and a Hamilton Anxiety Scale (HAM-A) total score ≥20 including a score of >2 on the anxious mood and tension items. Patients were excluded from the study if they met criteria for alcohol or drug abuse or dependence (currently or within the last six months), had mania or hypomania in the previous six months according to the MINI, a history of schizophrenia, bipolar disorder Type I, any other psychotic disorder (as defined in the DSM-IV-TR), any other serious medical condition, those having serious suicidal risk (investigator judgment), or had undertaken changes in their use of medication or therapy within two weeks of initial screening. This was an open-label study to examine the efficacy and tolerability of the SKY course as an adjunctive therapy for GAD in outpatients who had not achieved remission (HAM-A ≤ 7) following at least eight weeks of an adequate and stable dose of conventional therapy. The Sudarshan Kriya Yoga (SKY) course is a well-described, yoga-based stress reduction program usually taught over five or six consecutive days for a total of 22 h. This multi-component program includes yoga postures, advanced yoga breath techniques, brief guided meditation, self-reflection, and cognitive-based stress education and coping strategies. The instructor (RPB) is a physician and an experienced yoga teacher certified to teach the SKY course who has had more than five years experience in the presentation of similar programs internationally. During the SKY course, Victory Breath and Bellows Breath were introduced on the first day over a 3-h training session. A 30-min balanced set of yoga stretches was learned and practiced on day 2 during a 6.5-h training session, and the Long Sudarshan Kriya practice was learned on day 3 and repeated on day 4 (10 h training over 2 days). All techniques were performed every day from day 3. The breath protocol was followed by a guided meditation, body scan, and rest. The home practice with Short Kriya was introduced on day 5. Discussion of cognitive coping and stressor evaluation strategies took place at different times throughout the course. Subjects were provided with a chart demonstrating the yoga postures to guide their home practice. After completion of the SKY course, subjects were encouraged to practice the yoga breathing techniques at home for 20 min per day. In addition, they were offered group practice sessions for 2 h once a week led by other certified yoga instructors. Subjects were administered a variety of scales and test measures in the week prior and one month following the SKY course. The primary efficacy endpoint was the mean change from pre- to post- treatment on the HAM-A. The secondary efficacy endpoints were the mean changes from pre- to post- treatment in the Penn state worry questionnaire (PSWQ), anxiety sensitivity index (ASI), beck anxiety inventory (BAI), coping inventory for stressful situations (CISS; subscales for task oriented coping, emotion oriented coping, and avoidance oriented coping), beck depression inventory (BDI), intolerance of uncertainty (IUS), multidimensional perfectionism scale (MPS) subscales for self (MPS Self ), other (MPS Other ), and social (MPS Social ), social phobia inventory (SPIN), and Liebowitz social anxiety scale-self report total (LSAS_SR Total ), as well as the fear and anxiety (LSAS_SR F and A ) and avoidance (LSAS_SR Avoidance ) subscales. Forty-one subjects enrolled in the study with 31 completers. The primary reason for drop out, given by nine of the 10 subjects, was difficulty in managing the time required for participation. The one other drop out felt that the spirituality presented in the study did not match his belief system. Mean baseline scores for all scales used for completers and non-completers are included in [Table 1]. Patient demographics and pre-treatment scores for all of the enrolled subjects (i.e., ITT population) as well as for the subsets of those who dropped out and who completed the study are presented in [Table 2]. [Table 3] highlights the changes four weeks after completing the SKY course for the ITT population. Significant changes were noted for the HAM-A total score (t=4.59; P<.01) and the psychic subscale (t=5.00; P<.01), as well as near significance (given the Bonferroni correction) of the somatic subscale (t=3.25; P<.01). Only 29 subjects completed the HAM-A. The response rate was 73% (21 out of 29 subjects, defined as a decrease ≥50% on the HAM-A) and remission rate of 41% (12 out of 29 subjects, defined as a HAM-A score ≤7). No significant differences were noted in the BDI II pre- and post-treatment (t=1.30; P=ns), but the difference between pre-and post treatment approached significance for the BAI (t=1.83; P<.08). Significant changes were also noted in the ASI (t=3.60; P<.01) and on the PSWQ (t=2.04; P<.05). This is in contrast to the lack of significant changes noted on the IUS (t=1.38; P=ns) as well as MPS subscales for self (t=1.61; P=ns), others (t=-0.75; P=ns), and for social interactions (t=1.60; P=ns). While no significant differences were noted in the SPIN (t=1.21; P=ns), total LSAS score (t=1.51; P=ns), or the avoidance subscale (t=0.88; P=ns), there was a near significant difference noted in the fear and anxiety subscale of the LSAS (t=1.91; P<.07). On measures of strategies of coping, no significant difference was noted in avoidance oriented coping and were found in task-oriented coping ( t=-2.04; P<.05) and significant decreases were noted in emotion-oriented coping ( t=-3.45; P<0.02). Significant improvements were documented in patient anxiety four weeks after completing the SKY course, supporting the potential efficacy of this approach in people suffering from GAD. These findings are confirmed by the response rate (73%) and remission rate (41%) following the SKY course. 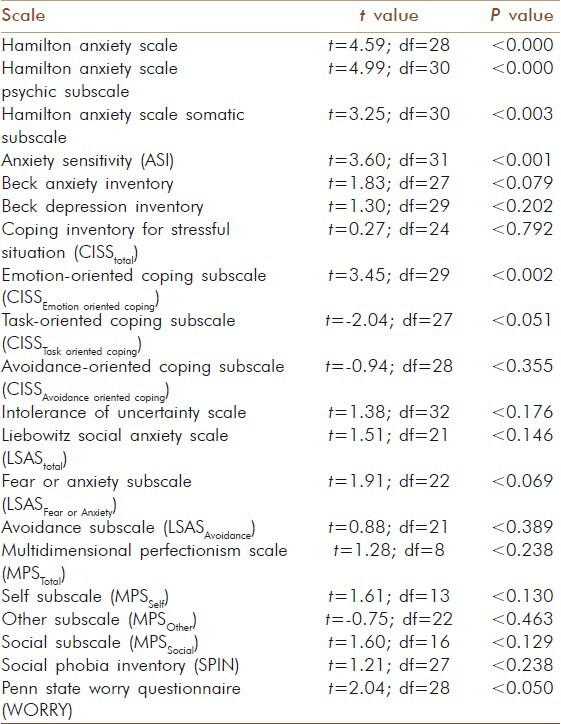 The lack of significant changes noted on the IUS and MPS subscales for self, others and social interactions suggests that the mechanisms that are targeted by these tests (intolerance of uncertainty and perfectionism) are not likely to account for the changes in anxiety associated with taking the SKY course. Conversely, data derived from measures of coping strategies approached significance on task-oriented coping and reached significance on emotion-oriented coping, which suggests that the changes in anxiety subsequent to attending the SKY course might have led to these improvements. This interpretation would be consistent with the lessons of the program that focus on improving acceptance of experiences and limiting catastrophization of terrifying thoughts or worries. Thus, the decrease in anxiety induced by the yoga practices may have been sufficient to increase task-oriented coping, an adaptive coping strategy. Similarly, from the improvement in emotion-oriented coping, it can be inferred that changes in less adaptive personality trait behaviors such as neuroticism which are associated with psychological distress are improved. The lack of differences noted in avoidance oriented coping, may have been a function of time, that is, the time to assessment may have been too short to detect the more long-term changes such as avoidance. The near significant difference in the fear and anxiety subscale of the LSAS may be analogous to changes in other anxiety symptoms in that one would expect to detect improvements in fear and anxiety long before the appearance of changes in avoidance. Again, the time frame of this study may have been too short to allow for changes in avoidance to emerge. Interestingly, significant differences were not noted on the BDI II scale, suggesting that depressive symptoms in patients diagnosed with GAD were not affected by the SKY course. However, BDI II levels were relatively low in subjects entering the trial with mean pre levels being 16.50 ± 12.59. Based upon the BDI II criteria for severity of depression, these subjects suffered from mild depression (defined as scores of 14 to 19),  indicating the possibility of a relative floor effect resulting in greater difficulty in detecting a change in their depression symptoms with the program. Several limitations are evident and, therefore, interpretations of this preliminary data must be cautious. Firstly, the data are open label and unblinded, such that demand characteristics may have played a role in the outcome. For example, it is possible that subjects felt pressured to score lower on the post-intervention anxiety scales. However, this concern is mitigated by the fact that test scores did not improve on all post-intervention measures. Furthermore, the absence of an active control group makes it impossible to control for the expectation effects of the intervention. Future studies could extend our preliminary data by providing an active control comparison group and blinding the assessors as to subject group assignment. Although patients were encouraged to continue practicing yoga at home for 20 min daily after the course, our study did not prospectively evaluate compliance to home practice and therefore its effects at the one-month follow-up are unknown. Finally, follow up beyond the first month after attending the SKY course would provide more information on long-term efficacy and the potential effects on symptoms, such as avoidance, that tend to improve later in the course of recovery. Our data are preliminary in nature and thus, data for compliance and follow up symptoms were not recorded. Nevertheless, of those who completed the study, 100% attended all five sessions. Future studies of breathing programs and treatment of anxiety should evaluate longer term follow up and compliance with home practice. In summary, this SKY course, a 22-h program delivered over five days, used as an adjunct to standard treatment in outpatients referred to a tertiary care center, was shown to be effective in significantly reducing anxiety in patients meeting criteria for GAD who had failed to achieve remission despite previous treatments with CBT and/or Mindfulness Based Stress Reduction (MSBR) and who were taking stable doses of psychotropic medications at the time of the study. The integration of Eastern mind-body practices and Western medicine bodes well for alleviating anxiety symptoms in those suffering from serious remission-resistant GAD. Future studies should explore the potential benefits of yoga interventions such as the SKY course within a longer time frame using a randomized controlled design with blinded assessment. We wish to thank the Art of Living Foundation for assigning instructors to assist in teaching the Sudarshan Kriya Yoga course and the follow-up sessions. 1. Kessler RC, Berglund P, Demler O, Jin R, Merikangas KR, Walters EE. Lifetime prevalence and age-of-onset distributions of DSM-IV disorders in the National Comorbidity Survey Replication. Arch Gen Psychiatry 2005;62:593-602. 2. Kessler RC, Chiu WT, Demler O, Walters EE. Prevalence, severity, and comorbidity of 12-Month DSM-IV Disorders in the National Comorbidity Survey Replication. Arch Gen Psychiatry 2005b;62:617-27. 3. Greenberg PE, Sisitky T, Kessler RC, Finkelstein SN, Berndt ER, Davidson JR, et al. The economic burden of anxiety disorders n the 1990s. J Clin Psychiatry 1999;60:427-35. 4. Statistics Canada. The Daily-Canadian Community Health Survey: Mental health and well-being (Canada Catalogue no. 11-001-XIE). Retrieved October 19, 2006, from Statistics Canada: Available from: http://www.statcan.ca/Daily/English/030903/d030903.pdf [Last cited on 2003, Sept. 3]. 5. American Psychiatric Association. Diagnostic and Statistical Manual of Mental Disorders, 4 th ed. DSM-IV-TR. Washington: American Psychiatric Association; 2001. 6. Wittchen HU. Generalized Anxiety Disorder: Prevalence Burden, and Cost to Society. Depress Anxiety 2002;16:162-71. 7. Wittchen HU, Zhao S, Kessler RC, Eaton WW. DSM-III-R generalized anxiety disorder in the National Comorbidity Survey. Arch Gen Psychiatry 1994;51:355-64. 8. Massion AO, Warshaw MG, Keller MB. Quality of life and psychiatric morbidity in panic disorder and generalized anxiety disorder. Am J Psychiatry 1993;150:600-7. 9. Olfson M, Fireman B, Weissman MM, Leon AC, Sheehan DV, Kathol RG, et al. Mental disorders and disability among patients in a primary care group practice. Am J Psychiatry 1997;154:1734-40. 10. Brawman-Mintzer O, Lydiard RB. Generalized anxiety disorder: Issues in epidemiology. J Clin Psychiatry 1996;57 Suppl 7:3-8. 11. Ballenger JC. Update on anxiety disorders. Arch Intern Med 1991;151:857-9. 12. Montgomery SA. Pregabalin for the treatment of generalised anxiety disorder. Expert Opin Pharmacother 2006;7:2139-54. 13. Kennedy SH, Eisfeld BS, Cooke RG. Quality of life: An important dimension in assessing the treatment of depression. J Psychiatry Neurosci 2001;26 Suppl: S23-8. 14. Kennedy SH, Dickens SE, Eisfeld BS, Bagby RM. Sexual dysfunction before antidepressant therapy in major depression. J Affect Disord 1999;56:201-8. 15. Michelini S, Cassano GB, Frare F, Perugi G. Long-term use of benzodiazepines: Tolerance, dependence and clinical problems in anxiety and mood disorders. Pharmacopsychiatry 1996;29:127-34. 16. Baldwin DS, Nair RV. Escitalopram in the treatment of generalized anxiety disorder. Expert Rev Neurother 2005;5:443-9. 17. Gelenberg AJ, Lydiard RB, Rudolph RL, Aguiar L, Haskins JT, Salinas E. Efficacy of venlafaxine extended-release capsules in nondepressed outpatients with generalized anxiety disorder: A 6-month randomized controlled trial. JAMA 2000;283:3082-8. 18. Pollack MH, Zaninelli R, Goddard A, McCafferty JP, Bellew KM, Burnham DB, et al. Paroxetine in the treatment of generalized anxiety disorder: Results of a placebo-controlled, flexible-dosage trial. J Clin Psychiatry 2001;62:350-7. 19. Rickels K, Downing R, Schweizer E, Hassman H. Antidepressants for the treatment of generalized anxiety disorder. A placebo-controlled comparison of imipramine, trazodone, and diazepam. Arch Gen Psychiatry 1993;50:884-95. 20. Katzman MA, Vermani M, Jacobs L, Marcus M, Kong B, Lessard S, et al. Quetiapine as an adjunctive pharmacotherapy for the treatment of non-remitting generalized anxiety disorder: A flexible-dose, open-label pilot trial. J Anxiety Disord 2008;22:1480-6. 21. Andrews G, Sanderson K, Slade T, Issakidis C. Why does the burden of disease persist? Relating the burden of anxiety and depression to effectiveness of treatment. Bull World Health Organ 2000;78:446-54. 22. Covin R, Ouirret AJ, Seeds PM, Dozois DJ. A meta-analysis of CBT for pathological worry among clients with GAD. J Anxiety Disord 2008;22:108-16. 23. Durham RC, Chambers JA, MacDonald RR, Power KG, Major K. Does cognitive-behavioural therapy influence the long-term outcome of GAD? An 8-14 year follow-up of two clinical trials. Psychol Med 2003;33:499-509. 24. Brown RP, Gerbarg PL. Sudarshan Kriya yogic breathing in the treatment of stress, anxiety, and depression: Part I-neurophysiologic model. J Altern Complement Med 2005;11:189-201. 25. Pilkington K, Kirkwood G, Rampes H, Richardson J. Yoga for depression: The research evidence. J Affect Disord 2005;89:13-24. 26. Brown RP, Gerbarg PL. Sudarshan kriya yogic breathing in the treatment of stress, anxiety, and depression: Part II-Clinical applications and guidelines. J Comp and Alt Med 2005;11:711-7. 27. Brown RP, Gerbarg PL, Muskin PR. How to use Herbs, Nutrients, and Yoga in Mental Health Care. New york: W.W. Norton; 2009. p. 71-106. 28. Lavey R, Sherman T, Mueser KT, Osborne DD, Currier M, Wolfe R. The effects of yoga on mood in psychiatric inpatients. Psychiatr Rehabil J 2005;28:399-402. 29. Ray US, Mukhopadhyaya S, Purkayastha SS, Asnani V, Tomer OS, Prashad R, et al. Effect of yogic exercises on physical and mental health of young fellowship course trainees. Indian J Physiol Pharmacol 2001;45:37-53. 30. Malathi A, Damodaran A. Stress due to exams in medical students--role of yoga. Indian J Physiol Pharmacol 1999;43:218-24. 31. Janakiramaiah N, Gangadhar BN, Naga Venkatesha Murthy PJ, Harish MG, Subbakrishna DK, Vedamurthachar A. Antidepressant efficacy of Sudarshan Kriya Yoga (SKY) in melancholia: A randomized comparison with electroconvulsive therapy (ECT) and imipramine. J Affect Disord 2000;57:255-9. 32. Janakiramaiah N, Gangadhar BN, Naga Venkatesha Murthy PJ, Harish MG, Shetty TK, Subbakrishna DK, et al. Therapeutic efficacy of Sudarshan Kriya Yoga (SKY) in dysthymic disorder. NIMHANS J 1998;16:21-8. 33. Naga Venkatesha Murthy PJ, Janakiramaiah N, Gangadhar BN, Subbakrishna DK. P300 amplitude and antidepressant response to Sudarshan Kriya Yoga (SKY). J Affect Disord 1998;50:45-8. 34. Vedamurthachar A, Janakiramaiah N, Hegde JM, Shetty TK, Subbakrishna DK, Sureshbabu SV, et al. Antidepressant efficacy and hormonal effects of Sudarshan Kriya Yoga (SKY) in alcohol dependent individuals. J Affect Disord 2006;94:249-53. 35. Carter JJ, Byrne GG, Brown RP, Gerbarg PL. Multi-component Yoga Breath Based Program Reduces PTSD in Australian Vietnam War Veterans: A Randomized Controlled Trial. Symposium on Yoga Therapy and Research. Los Angeles, CA: 2009. 36. Gerbarg PL. Yoga and Neuro-psychoanalysis. In: Anderson FS, Ediotr. Bodies in Treatment: The Unspoken Dimension. Hillsdale, NJ: The Analytic Press, Inc; 2007. p. 132-3. 37. Sageman S. Breaking through the despair: Spiritually oriented group therapy as a means of healing women with severe mental illness. J Am Acad Psychoanal Dyn Psychiatry 2004;32:125-41. 38. Descilo T, Vedamurtachar A, Gerbarg PL, Nagaraja D, Gangadhar BN, Damodaran B, et al. Effects of a yoga-breath intervention alone and in combinations with an exposure therapy for PTSD and depression in survivors of the 2004 Southeast Asian tsunami. Acta Psychiatr Scand 2010;12:289-300. 39. Gerbarg PL, Brown RP. Yoga: A breath of relief for Hurricane Katrina refugees. Curr Psychiatry 2005;4:55-67. 40. Bhatia M, Kumar A, Kumar N, Pandey RM, Kochupillai V. Electrophysiologic evaluation of Sudarshan Kriya: An EEG, BAER, P300 study. Indian J Physiol Pharmacol 2003;47:157-63. 41. Sharma H, Sen S, Singh A, Bhardwaj NK, Kochupillai V, Singh N. Sudarshan Kriya practitioners exhibit better antioxidant status and lower blood lactate levels. Biol Psychol 2003;63:281-91. 42. Pinninti NR, Madison H, Musser E, Rissmiller D. MINI International Neuropsychiatric Schedule: Clinical utility and patient acceptance. Eur Psychiatry 2003:18;361-4. 43. Sheehan DV, Lecrubier Y, Sheehan KH, Amorim P, Janavs J, Weiller E, et al. The Mini-International Neuropsychiatric Interview (M.I.N.I. ): The development and validation of a structured diagnostic psychiatric interview for DSM-IV and ICD-10. J Clin Psychiatry 1998;59(suppl 20):22-33. 44. Hamilton M. The assessment of anxiety states by rating. Br J Med Psychol 1959;32:50-5. 45. Pollack MH, Simon NM, Zalta AK, Worthington JJ, Hoge EA, Mick E, et al. Olanzapine augmentation of fluoxetine for refractory generalized anxiety disorder: A placebo controlled study. Biol Psychiatry 2006;59:211-21. 46. Reiss S, McNally RJ. The expectancy model of fear. In: Reiss S, Bootzin RR, editors. Theoretical issues in behavior therapy. New York: Academic Press; 1985. p. 107-21. 47. Peterson RA, Plehn K. Measuring anxiety sensitivity. In: Taylor S, editor. Anxiety sensitivity: Theory, research, and treatment of the fear of anxiety. Mahwah, NJ: Lawrence Erlbaum; 1999. p. 61-82. 48. Peterson RA, Reiss S. Test Manual for the Anxiety Sensitivity Index. Orland Park, IL: International Diagnostic Systems; 1987. 49. Peterson RA, Reiss S. Anxiety Sensitivity Index Manual (2 nd ed.). Worthington, OH: International Diagnostic Services; 1992. 50. Beck AT, Epstein N, Brown G, Steer RA. An inventor for measuring clinical anxiety: Psychometric properties. J Consult Clin Psychol 1988;56:893-7. 51. Beck AT, Steer RA. Beck Anxiety Inventory Manual. San Antonio: The Psychological Corporation Harcourt Brace Jovanovich, Inc; 1990. 52. Osman A, Kopper BA, Barrios FX, Osman JR, Wade T. The Beck Anxiety Inventory: Reexamination of factor structure and psychometric properties. J Clin Psychol 1997;53:7-14. 53. Endler NS, Parker JD. Assessment of multidimensional coping: Task, emotion, and avoidance strategies. Psychol Assess 1994;6:50-60. 54. Meyer TJ, Miller ML, Metzger RL, Borkovec TD. Development and validation of the Penn State Worry Questionnaire. Behav Res Ther 1990;28:487-95. 55. Arnau RC, Meagher MW, Norris MP, Bramson R. Psychometric evaluation of the Beck Depression Inventory-II with primary care medical patients. Health Psychol 2001;20:112-9. 56. Beck AT, Steer RA, Brown GK. Beck Depression Inventory manual (2 nd Ed.). San Antonio, TX: Psychological Corporation; 1996. 57. Buhr K, Dugas MJ. The intolerance of uncertainty scale: Psychometric properties of the English version. Behav Res Ther 2002;40:931-45. 58. Buhr K, Dugas MJ. Investigating the construct validity of intolerance of uncertainty and its unique relationship with worry. J Anxiety Disord 2006;20:222-36. 59. Hewitt PL, Flett GL. Perfectionism in the self and social contexts: Conceptualization, assessment, and association with psychopathology. J Pers Soc Psychol 1991;60:456-70. 60. Hewitt PL, Flett GL, Turnbull-Donovan W, Mikail SF. The multidimensional perfectionism scale: Reliability, validity, and psychometric properties in psychiatric samples. J Consult Clin Psychol 1991;3:464-8. 61. Connor KM, Davidson JR, Churchill LE, Sherwood A, Foa E, Weisler RH. Psychometric properties of the Social Phobia Inventory (SPIN): New self rating scale. Br J Psychiatry 2000;176:379-86. 62. Rytwinski NR, Fresco DM, Heimberg RG, Coles ME, Liebowitz MR, Cissell S, et al. Screening for social anxiety disorder with the Self Report Version of the Liebowitz Social Anxiety Scale. Depress Anxiety 2009;26:34-8. 63. Weisstein, Eric W. "Bonferroni Correction." From MathWorld--A Wolfram Web Resource. Available from: http://mathworld.wolfram.com/BonferroniCorrection.html [Last cited on 2011 Aug, 8]. 64. Stanley MA, Wilson NL, Nony DM, Rhoades HM, Wagener PD, Greisinger AJ, et al. Cognitive behavioural therapy for generalized anxiety disorder among older adults in primary care: A randomized clinical trial. JAMA 2009;301:1460-7. 65. Evans S, Ferrando S, Findler M, Stowell C, Smart C, Haglin D. Mindfulness-based cognitive therapy for generalized anxiety disorder. J Anxiety Disord 2008;22:716-21. 66. Stein DJ, Ahokas AA, Bodinat C. Efficacy of agomeltine in generalized anxiety disorder: A randomized, double-blind, placebo-controlled study. J Clin Psychopharmacol 2008;28:561-6. 67. Ferrero A, Piero A, Fassina S, Massola T, Lanteri A, Daga GA, et al. A 12-month comparison of brief psychodynamic psychotherapy and pharmacotherapy treatment in subjects with generalized anxiety disorders in a community setting. Eur Psychiatry 2007;22:530-9. 68. Nimatoudis I, Zissis NP, Kogeorgos J, Theodoropoulou S, Vidalis A, Kaprinis G. Remission rates with venlafaxine extended release in Greek outpatients with generalized anxiety disorder. A double-blind, randomized, placebo controlled study. Int Clin Psychopharmacol 2004;19:331-6.